The Order of the Ulftönn (Wolf's Tooth) of Starkhafn is an award bestowed by the Baronage of Starkhafn. Its symbol is a white wolf's tooth with subsequent awards being signified by the addition of white beads onto the cord, one for each reception of this honour. Members of this order are called Companions of the Wolf's Tooth. "The wolf is known for its ferocity, its skill in the hunt, and its loyalty to its pack. 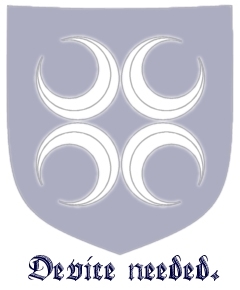 Like the wolves of the wild, sometimes one of our numbers is distinguished for their bravery, skill at arms, and the protection offered to the populace of the Barony. Thus was created the Order of the Wolf’s Tooth of Starkhafn. It is only awarded to a single warrior at any event in recognition for paramount ability, courage and service in the area of armored combat." The token of this order shall be a white wolf's tooth dependent from a cord, with subsequent awards being signified by the addition of white beads onto the cord, one for each reception of this honour. This page was last modified on 29 March 2019, at 18:44.